In a recent newsletter we asked for prayer for a young boy named Joshua Glenn. His grandmother, Rosalie, is a friend of DeAnna. Rosalie has raised Joshua since infancy and in January after a fall from a mango tree, it was discovered he has cancer. He’s been a tough fighter and has gone through so much. Two weeks ago, after many chemo therapy treatments and many blood transfusions, the doctors decided it was time to discontinue treatment and try to help him with pain management. We’re all still praying for miraculous healing. His 10th birthday was Monday. A colleague, who has been walking this road with Rosalie, and I (DeAnna) went to visit Joshua and celebrate his birthday with him. He’s a special little guy who is like any other 10 year old. He likes toys, he knows what he wants, he’s fiercely independent over things he can do for himself and wants to be a kid. 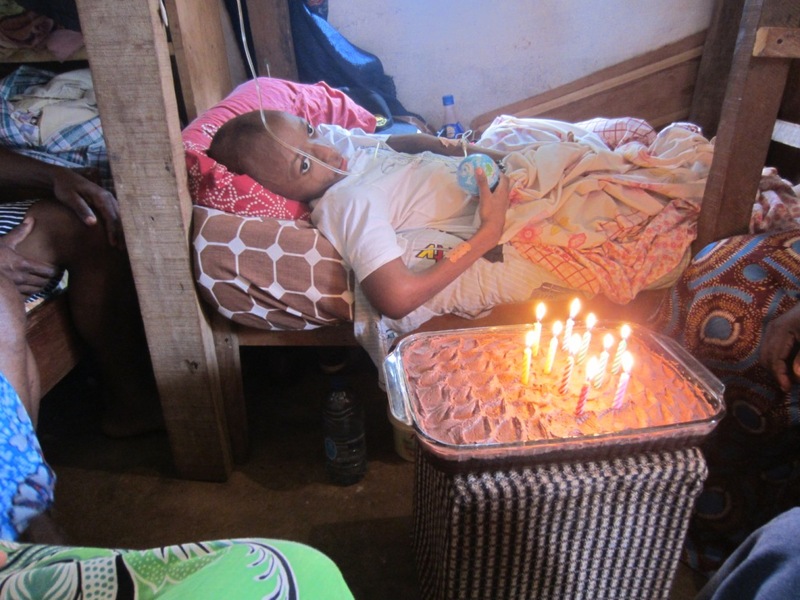 This entry was posted in Cameroon and tagged Cameroon, Cancer. Bookmark the permalink. Praying now. May the light and love and mercy of Jesus overshadow him in his time of great need. No words, Love you guys and am amazed at how God is using you. That’s an impressive birthday cake. If making a wish before blowing out the candles could come true, I hope he wished for healing. Praying for miracle healing for him and for his salvation. This is heartbreaking situation. Is there anything I can do?